If you’ve come to this page, you’ve undoubtedly heard of dental implants (if you haven’t, we suggest that you read our full page about them right here.) To put it mildly, they simply are the best way to replace missing teeth and fill in the gaps in your smile. 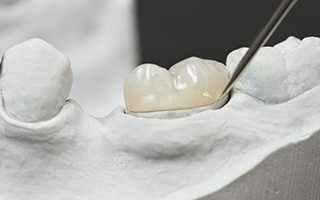 On this page, we’re going to discuss what actually goes on the implant post themselves, and how these restorations can be used to replace your missing teeth. If you are missing a single tooth, we will most likely replace it with an implant-retained crown. The crown itself will be made entirely of dental porcelain, which is one of the most advanced materials in all of dentistry. Dental porcelain gives you the best of everything, as it can mimic a natural tooth in every possible way: shape, size, color, strength, and even feel. 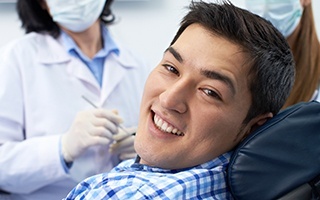 The crown itself will actually go over a supporting post that is connected directly to the dental implant. It is called an abutment, and it will be the same shape and size as the tooth it is replacing. The crown just slips over the top of it, and when they come together, you get a strong and natural-looking tooth that completely blends into your smile. For a person missing a few teeth in a row, an implant-retained bridge is likely the best solution. For this, implant-retained crowns will be placed on either side of the gap in the smile, and these will be attached to prosthetic teeth that literally “bridge” the gap. 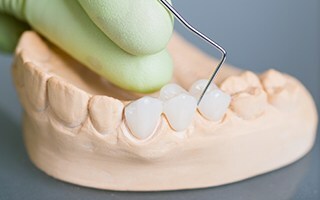 Implant-retained bridges cannot only improve the appearance of a smile, but they can also prevent the remaining teeth from shifting, therefore preventing potentially painful and complicated bite alignment problems. Just like with implant-retained crowns, it will look completely natural and look just like your other teeth. Both of these restorations can easily last for decades with the proper maintenance (which just involves regular brushing and flossing), and you’ll love how they make your smile look. To learn more about them, or to schedule an appointment to get them, simply contact our office today.